I've nothing to show as of yet but there will be a few Halloween theme coming up, I promise. Yes, it's gonna be a belated treat due to exam and I need a reason to bake. Occasions like birthdays and anniversaries. I sorta have something in mind. Now, it's just putting pieces together and form something horrific and terrifying. So just be patient and wait. Bull's-eye, frog-in-a-pond, toad-in-the-hole...whatever you call them, these require little ingredients, if not ingredients you readily have in your patry to make. I like calling them picture-frame egg. That was what I was thought when I joined a girl's scout when I was 12. This is a famous camp food. However, instead of using the stove and a pan to fry this, I used the oven to bake them instead. Line a baking tray with aluminium foil and lightly spray it with canola oil. Place 2 squares of bread on the aluminium foil. Place 2 squares of cheddar cheese (I use Kraft's) on each slice of bread and cover them with another slice of bread each. With a round glass or any other object, make a cutout from the centre of each cheese-sandwiched-bread. Place them side by side on the aluminium tray as well. Have 2 eggs ready and lightly beat them and season with a little salt and pepper (you can choose to omit beating if you wanna make a sunny side up). Spray a lil' canola oil everywhere randomly before popping it into the oven to bake for about 10-15mins. This helps in giving it a nice even golden brown. The cutout bread sandwiched with cheese tasted awesome. It tasted like the crusty bread from Lamb Stew & Crusty Bread. Crispy and light. Very hollow with each bite. 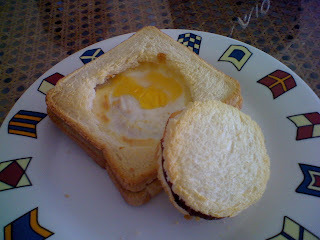 These Polo Bun/Por Lor Yau/Pineapple Bun are what I initially made in accordance with World Bread Day. However, I chose to use the tri-col0ured bread as my post instead of this. Let me clarify first of all, I'm not from Hong Kong but I do love these buns a lot when I was in Hong Kong for a holiday trip and secondly, these buns have no pineapple in it. The name is derived from its appearance (check out the criss cross pattern). I've used the recipe here which I've nicely translated it to English for you all with important tips and points to note. This is the bread dough placed in a greased pot and covered with a damp cloth, left to prove in a warm ambience. That's the polo pastry, the crispy crumbs on top. The picture above is after being eggwashed and criss-crossed. The first picture above is how it looked like after proving. You could do criss cross like that too if you like but do not cut in too hard like me. Lightly will do. The buns ready to be baked. The pattern is visible but not really touchable.... Hmmmm, probably I cut in too hard. I think the only hard part about making the bun is when you need to assemble th polo pastry with the brad dough. I didn't encounter that sorta problem because I've done that numerous times :) If you look at the original site where I got the recipe, you will notice one need to expand the polo pastry and have it cover at least 3/4 of the bread dough. It's like wrapping a filling into a bun but you don't do it all the way. Or like wrapping mooncake filling with the skin to get even skin (Picture 9 to Picture 13). Just click on the link leading to original recipe and you'll understand what I mean. It's really not as hard as it seems. 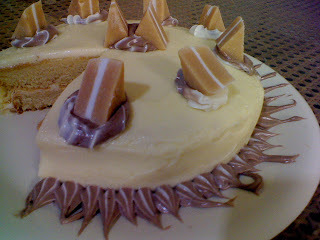 And the original recipe posted comes with lots of step-by-step photos. I do not have a breadmaker so I mixed all the above except for buter and knead for about 5mins. I then add in the butter and knead for about 15mins to form a smooth dough. I did not add in any extra water. It was very very very (yes, I stress here, very very very!) sticky even after adding in the butter but as you keep kneading, it will form a smooth, non-sticky dough. Here, a plastic spatula really helps in scrapping the dough off the table and back into the dough again and again. Lotsa of banging and throwing of the dough probably helps as well. Upon getting a smooth dough, prove it, covered until 2.5 times its original size. I prove it for an hour or so. While the bread dough is raising, make the polo pastry. Beat the butter until light and fluffy and gradually add in the sugar, salt and milk powder. For me, I beat until all sugar dissolves. Add in the tablespoon of egg and have everything bind together. Lastly, fold in the plain flour and do not overmix. It's alright if it is sticky and you could add in a little extra plain flour (just a little). Divide into 4 portions and chill it in the fridge fo 30mins. I did not add in any extra flour and used a plastic spatula to have everything come together nicely. I then weigh it and chill it in the fridge until ready to use. I need to stress this again, a plastic spatula really helps! By now, the bread dough should be ready. Check the bread dough to see if it pass the finger tip test (use a finger and press into the dough surface. If the indentation made stays, then it's done. If it springs back then it's not ready yet and prove longer). Once ready, punch out all the gas within the bread dough and knead lightly. Weigh into 4 portions and roll into rounds. Let it rest for 15mins. After 15mins, remove the chilled polo pastry from the fridge and roll into perfect rounds. Now, assemble them together. Expand the polo pastry by applying gently even pressure so that it covers more than 3/4 of the dough. 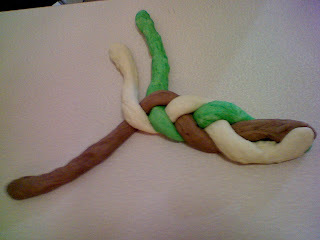 Twisting and turning the dough helps in covering it evenly too. Add 1 tsp of milk into previous leftover egg mixture and use this as egg wash. Brush onto the 4 buns. With a sharp knife, gently draw criss cross/chequered patterns onto each bun. Prove it again until 2.5 times its original size. (I did this by leaving the tray in the oven, door closed for 1 hour). Bake at a preheated oven : 180°C for 15mins or until golden brown. Nevertheless, these were good and definitely a keeper. Ver soft and fluffy right our of the oven. Upon cooling or reheating it in the microwave, it sorta got toughen up a little and didn't taste as good. If I'm gonna keep it until tomorrow, I'll probably reheat it in a preheated oven at 160°C for about 7 mins. I like mine plain or probably with a square of butter. That's the original way and how it's supposed to be. That's the end of this post. I do hope you all will try it and like it just as much as I did. 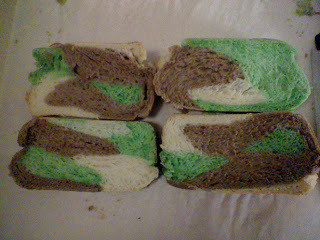 Firstly, this is what I did in conjunction with World Bread Day, a tri-coloured bread. This is crazy, this is midnight baking. The loaf just finish baking at 11pm! Secondly, I sincerely wanna dedicate this blog post to Happy Home Baking. This is not much of her recipe, more like her ideas and teachings that she shared with fellow bakers in order to make bread baking more fanciful. 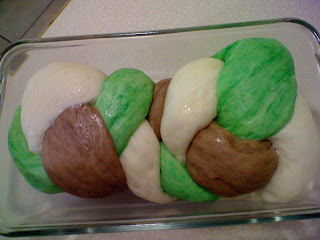 A normal loaf of bread could be turned out into many ingenious loaves if twisted here and there. She should have participated, looking at the amount of breads and buns she made. All very nicely done and very creative. Due to the fact that she is busy coaching her kids for exam (what a nice Momma! ), I've done this on behalf of her. Hence, I wanna credit back this bread to her. The brown one is tinted with 1 tsp of cocoa powder. 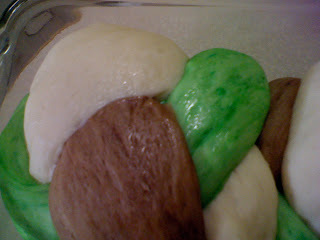 The green one is tinted with 1/2 tsp of pandan paste. HHB used green tea powder instead. 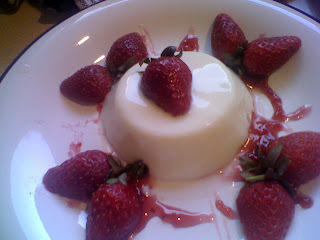 The white one is added with 1 tsp of milk powder instead of leaving it plain. This are the 3 different flavours dough proving in my room, right in front of a heater. The finger tip test. When dough is ready, poke it and it shouldn't spring back. If it does, that means the dough is not ready. If dough springs back and cover up the hole you made with your finger tip, prove longer. Both ends tucked down neatly.A little uneven eh? See how ugly it is after proving. I do not have a Pullman Tin hence I placed some flat weight on top of the Pyrex pan when I prove it and bake it. The only good thing here is that my plain colour dough did not pull away from the rest upon proving. I think the 1 tsp of milk powder kneaded into submission helps. 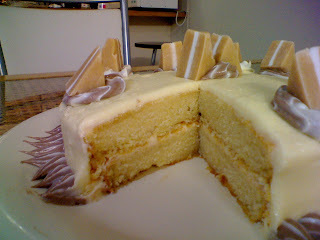 Upon baking and slicing. I love how each tiny rectangular slice has all three colours in one. 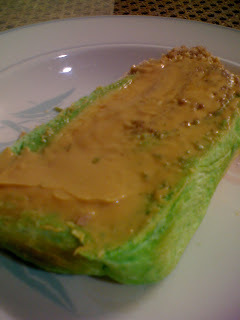 Only pandan taste was distinct. But really, this bread is so plain on its own. Nothing taste better than slapping a thick layer of peanut butter on a slice of warm bread, have it melt into the bread a little and eat it up! Thank you Happy Home Baking! I've jotted down a list of long breads and buns from your blog to bake after my exam! Finally, Happy World's Bread Day to everyone! Have you bake something yet? If not or running out of time, hurry up and run to the nearest bakery store and grab something you like and blog about it! I am lagging behind many posts. I promise I will update as soon as my exams are over. The last day of exam will be Nov 10, 2008. 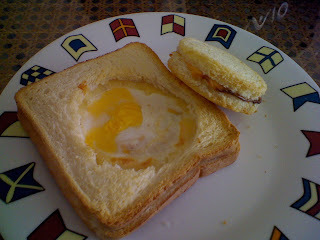 Nevertheless, I don't wanna miss out on this year's World Bread Day which is falling on Oct 16, 2008, a Thursday. I have something in mind and couldn't wait to post it up! Till then, back to piling up workloads and studying again! P/S: I am so happy! One of my recipe, the lavender tiramisu is stated as one of the 50 Best Edible Flower Recipes Ever. 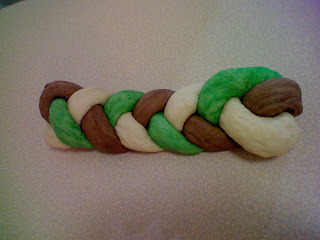 Thanks to Baking Delights whom incredibly combined 50 links together (mine is No.27!) 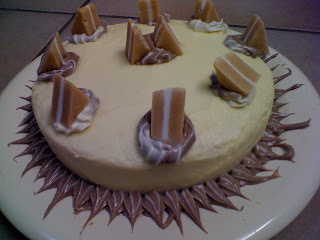 and think my lavender tiramisu must be good enough to deserve a rank there. Indeed it was lovely, exotic and very indifferent! Whisk together yogurt and buttermilk. In another microwavable bowl, combine gelatine and water and let it bloom for 5mins. Then, microwave on HIGH for 45secs. Repeat if some gelatine did not fully dissolve. Stir in sugar and vanilla essence (if using) into the hot mixture and stir until al sugar dissolve. Cool the gelatine mixture slightly and whisk it into the yogurt mixture until well combined. Divide the mixture into 6 lightly greased medium sized muffin holes and refrigerate until dinner time (at least 3 hours). I chill it for 5 hours. To unmould, dip ramekins in very hot water for about 5secs and invert onto a baking paper. 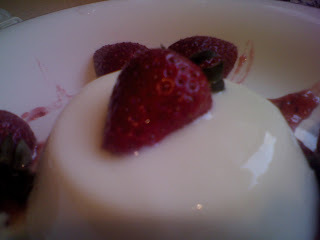 Gently scoop each panna cotta with spatula and placed it on individual plates brushed with strawberry preserves. With me being so far from you, I've nothing to give you except for this post and a virtual birthday cake for you. Well, not exactly virtual but you couldn't taste it so that's just too bad. 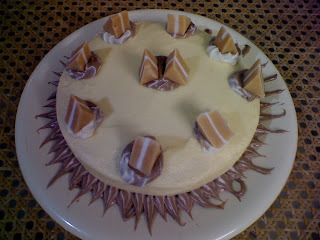 That's a Bailey's White Cake decorated with Jerseys Caramel and buttercream frosting. Looked like a sunflower, don't you think so? I've savored a slice of cake on behalf of you and goodness gracious, it was awesome and terrific! I've spent a lot of time working on the cake and the decorations. I do hope you like it. However, it wasn't really fun having to bake a birthday cake alone. It would have been great if you and Angie could be around as well to mess up my kitchen. I promise you I would so make up for your birthday when I'm back for holidays! I shall end this post with no stereotype birthday song but a birthday poem which I thought really suits you. May all your journey in life and future undertakings be as easy as a piece of cake! 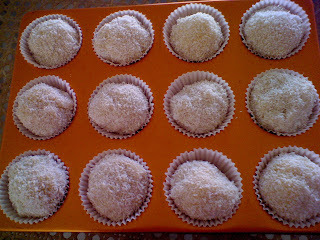 I did these little mochi using the recipe from Florence. Instead of mango, I used honeydew balls instead. I am a little disappointed. There's nothing wrong with her recipe. It's just that I did so many substitutions and used sucky fruits and it made the whole thing turned a lil' head-wired. 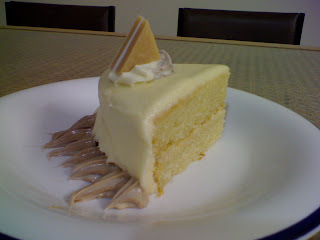 I used only evaporated milk in the skin instead of using any honeydew juice or mango nectar. Also, my honeydew was too soft so I kinda fiddle a lil' with wrapping. It's not that I couldn't wrap them like the many problems faced by other bloggers. I could wrap them up really nice with guidance from a video posted by Irene Chan Wai on YouTube. She taught me to use plastic gloves and how to do a beautiful mochi skin. It's just that my honeydew is too soft for wrapping. By the time I realise that, it was a lil' too late cuz I've made the skin and I do not have any other fruits left in the house. 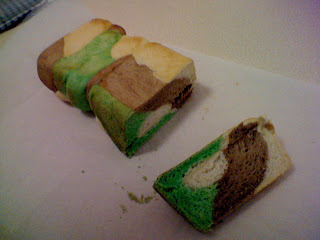 I'm so gonna try this with durian filling and tell you guys how it goes. I've no idea yet how I could wrap the durian flesh in nicely but I promise I will give it a second thought. Add in 1/2 tbsp corn oil and stir to mix. Stir wet mixture into flour mixture and mix to combine. Pour batter into a greased shallow plate and steam on high heat for 30 minutes. Remove from steamer and stir the cooked dough with a flat plastic knife till it is smooth. Coat with dessicated coconut and chill well before serving. Till then, that's it for now.